Car radio with MP3 player, Pioneer, 4x50W, USB, AUX, MVH-S110UBA Car radio with MP3 player, Pioneer, power 4x50W, and USB and AUX inputs. Dimmable orange backlight and black body color. RADIO MP3 PLAYER SCM261BT, 4X40W, USB, AUX, SD card USB auto player for SCM261BT, 4x40 W, USB, AUX, SD card reader. 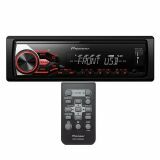 Radio MP3 player car, PIONEER MVH-181UB, 4X50W, USB, Remote control USB player car Pioneer MVH-181UB, a 4 x 50 W, an RDS tuner, supports Android to feature Advanced Remote Control App (ARC) - Turning your smartphone into a remote control of the player. Radio MP3 Player car player for Pioneer MVH-190UBG, 4x50W, USB The MVH-190UBG 4 x 50W RDS Pioneer car player with tuner supports Android with the Advanced Remote Control App (ARC) that turns your smartphone into a remote control for the player. Radio MP3 Player for car Pioneer MVH-190UB, 4x50W, USB, AUX, RCA, Android USB player car Pioneer MVH-190UB, 4x50 W, USB, AUX, RCA, Android, compact with drop-down panel. List Price: 299.00лв. VAT Incl.